Starting Dec. 12, we’ll be blogging the “12 Days of Fishmas.” Each day we’ll feature a different species that you can see during your visit to Birch Aquarium at Scripps. Love this species? Consider our Adopt-A-Fish program and help us keep these animals thriving! 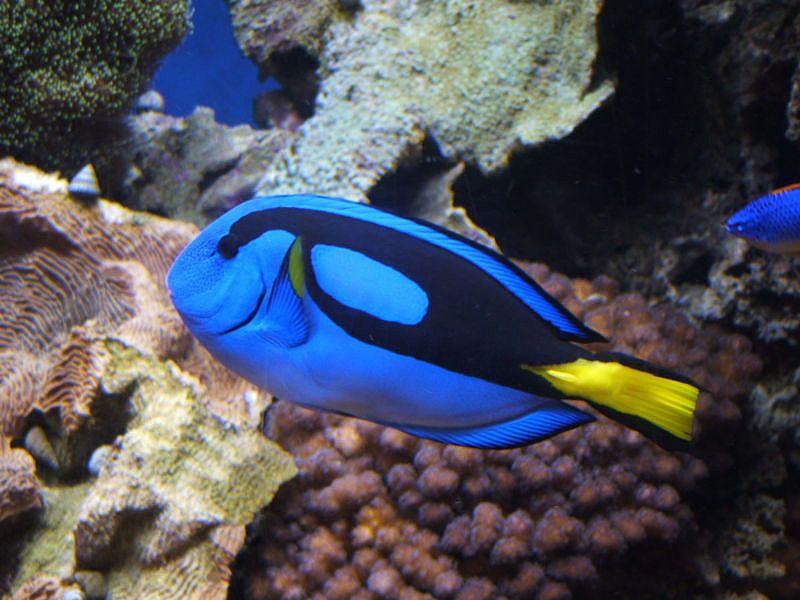 You can find blue tangs, a gorgeous tropical fish, in our Western Pacific coral tank. They are electric blue with a flat, broom-shaped, bright yellow tail bordered in black. A large black band along this fish’s body inspired the nickname “palette surgeonfish” – the marking is shaped like an elongated painter’s palette stretching from the base of the tail to the eyes. Coral reefs provide blue tangs with good places to hide when threatened. Being a tropical fish, blue tangs keep to waters of 75-78 degrees Fahrenheit and can be found in a number of areas of the Indo-Pacific region, including the coast of East Africa, the Mascarene Islands to Kiribati, Japan, south to the southern Great Barrier Reef, New Caledonia, and Samoa. Blue tangs travel more or less alone or in loose association with other adults; younger blue tangs like to hang around antler coral (Pocillopora eydouxi) in tight groups. They have a curious nature but have been known to “play dead” when newly introduced to a tank. Blue tangs eat a widely varied diet. 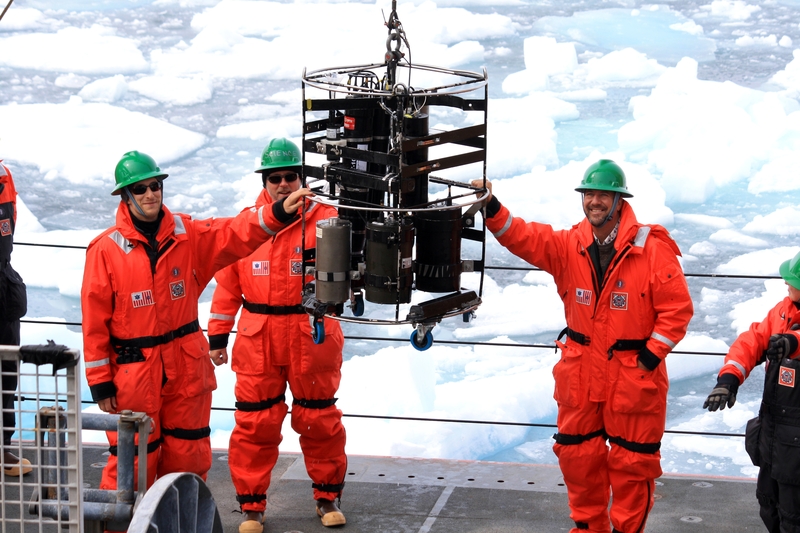 They mainly catch zooplankton such as mysids, brine shrimp, and other microorganisms. They also eat seaweed and algae. Blue tangs are not an aggressive fish but they do come armed. At the base of its tail are venomous spines that extend outward when alarmed or provoked. These scalpel-shaped weapons are the reason this fish is often called a surgeonfish. With a quick, sideways thrash of the tail, a blue tang can produce gashes that will swell, discolor, possibly become infected, and can hurt for hours. “Hi, I’m Dory!” The Disney character from “Finding Nemo” had no short-term memory. Imagine if she tried to remember all the other names for her species: Palette surgeonfish, Flagtail surgeonfish, Blue surgeonfish, Pacific blue tang, Indo-Pacific blue tang, Regal tang, Hippo tang, and Yellowtail tang. Come see three Blue Tangs in our Western Pacific tank this holiday season. Blue Tangs are just a few of the 3,000 fish and invertebrates that thrive at Birch Aquarium at Scripps. 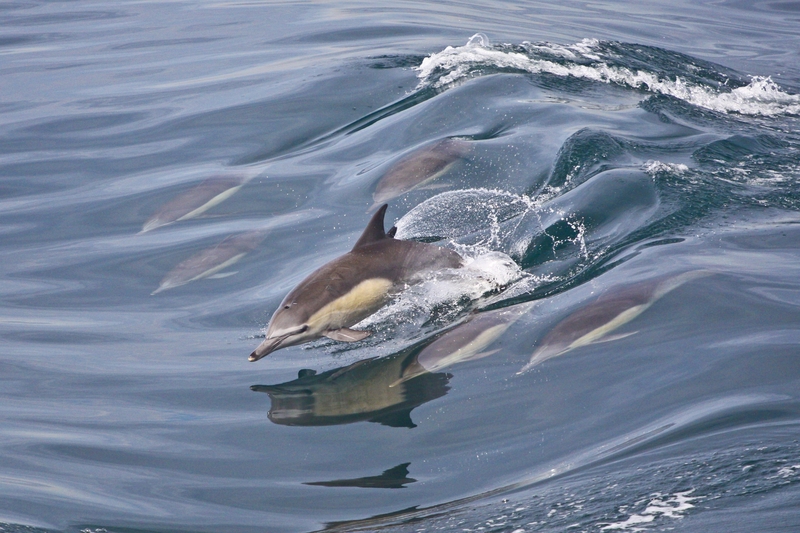 By adopting one today, you can be part of the team that provides essential care to these special ocean inhabitants. Find out more about the Aquarium’s Adopt-a-Fish program.